HMS Abercrombie shortly after commissioning. Note the simple design of this monitor. IWM photograph SP 140. These weapons and mountings had an unusual history. The Mark II guns were built by the Bethlehem Steel Company as part of a sub-contract from a German firm building the battlecruiser Salamis for Greece. 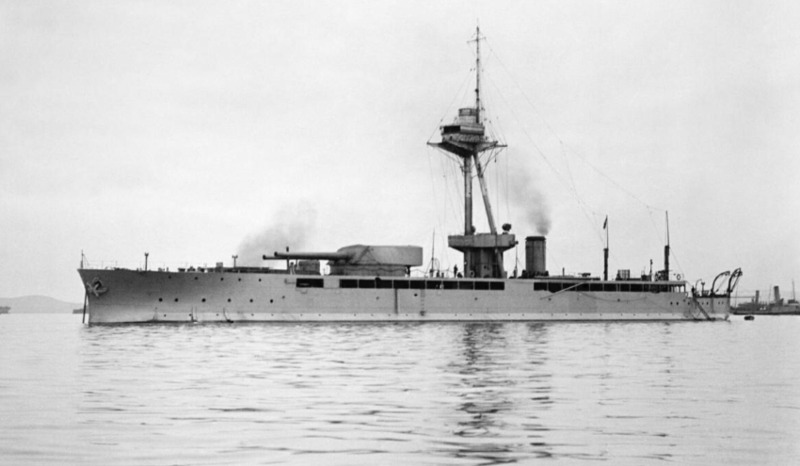 After the start of World War I halted work on the battlecruiser, the guns and mountings were purchased by Britain to speed up construction of four monitors. The guns and mountings were disassembled and shipped to the Coventry Ordnance Works (for the Belfast-built monitors) and to the Elswick Ordnance Works (for the Tyne-built monitors). Besides the guns and twin mountings, Bethlehem Steel also sold Britain four complete sets of turret shield armor, two sets of 8 inch (20.3 cm) barbette armor and 4,000 rounds of ammunition. The Bethlehem mountings were electrically powered and quite unlike anything built in Britain. After their re-erection and check-out problems were corrected, they proved to be very reliable in service. These monitors were originally known as M1, M2, M3 and M4, then redesignated as Admiral Farragut, Robert E. Lee, Stonewall Jackson and General Grant (showing their USA heritage). However, US diplomatic protests meant that they finally entered service as Abercrombie, Havelock, Raglan and Roberts. Eight of these guns were built to the Bethlehem design and consisted of a thin A tube and three layers, each of three tubes. The breech bush screwed into the outer two tubes and the hand-operated breech mechanism resembled the British Elswick type. The outer tubes were apparently not locked together very well and the guns drooped for the first few salvos until they warmed up after which they locked together properly. 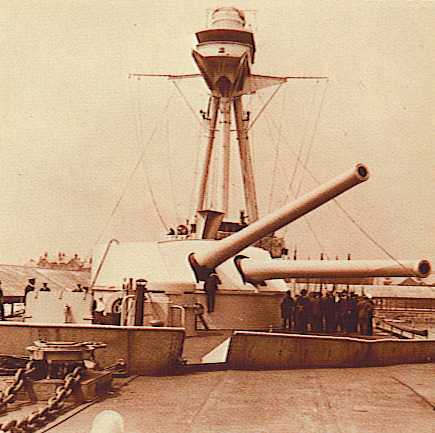 A further two guns were built by Woolwich as spares and were also designated as Mark II. These were to standard British wire wound construction standards but kept the same external contours as did the Bethlehem guns. These two guns were used to regun Abercrombie in May 1918. The two Bethlehem Mark II guns removed from Abercrombie in 1918 were closely examined by the British ordnance experts at Woolwich. The British were not impressed by the construction of these guns, noting that their poorly locked hoops and thin A tube gave them a low degree of safety. The general conclusion reached was that there was no particular advantage to copying USN practice in naval guns, mountings or propellant. However, they did conclude that all-steel guns built with few tubes would be superior to wire-wound guns. All-steel construction was adopted post-war and most British guns built after about 1930 were of that type. See 15" (38.1 cm) Mark I, 18" (45.7 cm) Mark II and 12" (30.5 cm) Mark XIV for further information on the British transition from wire-wound to built-up construction methods. Although the British were unimpressed with the overall design of these guns and mountings, they did perhaps perform better under fire than did contemporary British designs. In January 1918, HMS Raglan was holed through the barbette by a 28.3 cm (11.1 in) shell from the former SMS Goeben, now the Turkish Yavuz Sultan Selim. This hit ignited charges in the hand-up chambers between the handling rooms and gunhouse, but the flash was contained and did not spread below to the magazines. This may also have been due to the fact that the propellant was USN nitrocellulose and not British cordite. The accuracy of the Bethlehem guns varied from ship to ship. Abercrombie was noted for her accurate shooting, but Raglan's shots seemed to sometimes fall short. It was found that Roberts shot better after the guns had warmed up after a few shots. Late in World War I, British cordite was substituted for the US nitrocellulose propellant originally supplied. This resulted in a substantial loss of muzzle velocity and a matching reduction in maximum range. The 14"/45 (35.6 cm) Mark IV designation was given to two ex-USN guns provided as spares for the Abercrombie class but never used. These were similar to the Mark II but built with a very thin inner "A" tube and with the outer tubes properly locked together. Two further USN guns were provided and, as these differed by the use of Asbury roller cam breech mechanisms, were designated as Mark V. None of these Mark IV and Mark V guns were ever used by the British. As all of these guns were built to USN standards, their bore length by British standards was 44.5 calibers. The data that follows is specifically for the 14"/45 (35.6 cm) Mark II. Monitors usually fired slowly during bombardment missions, generally about one round per turret every 2.5 minutes, which allowed time for corrections. Although the USN manufactured AP rounds for all their 14" (35.6 cm) guns, the British outfit for these monitors apparently consisted only of HE rounds. The original purchase from Bethlehem Steel included 500 rounds per gun. Additional projectiles were made in Britain and were entirely 4crh HE rounds. Additional NCT propellant was supplied from the USA, although cordite was substituted towards the end of the war. When examined by Woolwich, it was found that Abercrombie's guns were only about a third worn after firing about 250 rounds. Monitors also had 15 practice rounds per gun. NCT propellant was supplied in four equal charges. It was noted in Britain that the stowage containers for these were not airtight and the performance was less consistent than cordite charges used with other guns. Care had to be taken to maintain a steady magazine temperature and to select bags and projectiles of as near as possible equal weights before firing missions. For comparison, the concurrent USA 14"/45 Mark I had a range of 23,000 yards (21,000 m) for a 15 degree elevation with a muzzle velocity of 2,600 fps (792 mps). Data from "Big Gun Monitors." This is an estimate, as these guns did not fire APC rounds while in British service. N/A, but probably 0 degrees, the same as US 14"/45 (35.6 cm) mountings of the time. Shells were stored vertically, nose-down, similar to arrangements on the first US battleships with 14" (35.6 cm) guns. As the mountings were electrically powered, two 200 KW generators were installed, which is noted as being double the requirements for a British cruiser. The magazine and shell room were on the same level in order to keep them as far below the waterline as possible. Total mounting and gun crew was 67 men. HMS Havelock being toured by journalists in May 1916. Following the Lowestoft Raid by German battlecruisers in April 1916, Havelock was moored in the Hamilton Dock at Lowestoft.